When it comes to construction in the healthcare industry, there are many safety concerns that differ from other industry projects. When hiring a construction company to build out any healthcare facility, it should be of the utmost importance to hire an organization that cares not only for the conditions needed for the build out, but also for the safety of their employees while on site. In 2017, a National Safety Council survey found 58 percent of Americans working in construction—the industry that sees the most workplace fatalities each year—feel safety takes a backseat to productivity and completion of job tasks. Fifty-one percent surveyed say management does only the minimum required by law to keep employees safe, and 47 percent say employees are afraid to report safety issues. With this mentality being so prevalent, it is important organizations raise awareness for what should matter most—keeping employees safe. An award-winning construction safety organization, Elzinga & Volkers, takes safety seriously. The organization makes safety a priority by having an established safety committee, having a dedicated leadership team, providing support to employees and making safety an ongoing conversation with all staff. Noise levels must be monitored when building anything in healthcare, whether it be a doctor’s office, hospital or anything in between. Each facility has certain guidelines the construction provider must be aware of and abide by. Studies have shown patient sleep disruption from noise is a major concern in healthcare facilities. With continued technological advancements, this should not be the case as there are many alternative options to consider. When looking at a construction provider, this should be a large consideration when setting construction plans. Ignoring the importance of sound quality in each facility during construction can cause further issues in the long run. Dust levels can impact the health of patients in recovery. This component sometimes comes as an afterthought when building healthcare facilities but should remain top of mind. When plans are developed for start of construction, the plans should consider how air will flow throughout the establishment. This will help ensure it is easy for employees to keep spaces clean to prevent further spread of infection among patients. Life safety is a major focus for large construction projects for facilities in the healthcare field. Building smoke barriers and temporary walls to allow enough time for evacuation of a floor or unit in case of emergency is vital. Construction organizations should take the lead on developing the proper set up for life safety implementation features. The chosen construction provider should perform assessments prior to the start of construction to determine what level of risk there is for the spread of infection in each area of the establishment. There should then be a plan determined and executed for controlling any spread. Use of the appropriate equipment throughout the project is needed to negate risk. 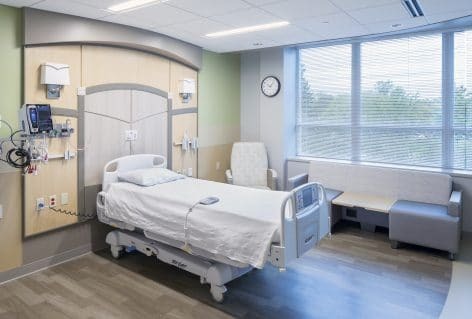 Infection control standards vary in each state, so ensuring the construction provider has up-to-date standards will help save costs over time. When construction projects begin for any healthcare facility, all parties should be aware of the safety regulations that go into each development. Construction organizations that treat safety as an utmost concern, not only for final development but also for workers during construction, should be highly considered when taking on these important projects. A healthcare establishment is meant to keep people safe and healthy and that should begin before the first brick is laid.